“Lashing out furiously like a corned dog, I managed to free the collar of my cardigan from the security guard’s grip and started to free fall into a void, my long hair trailing swiftly behind me. It was blacker in the rubbish chute than the darkest, loneliest part of the night. Twelve year old Evie is an orphan. Or at least as far as she’s aware, she is. Her mum has died and she has never known her dad. Now Scott, her uncle, is taking her to New York to live with him and Evie can’t think of anything worse. She wants to stay in Ireland with her mum’s best friend and her Godmother Janet. Can being in the Big Apple persuade her to stay? While Evie starts falling in love with her supposedly temporary home and making friends she can’t help but want to go home, especially when Scotts meddlesome girlfriend, Leela, is scheming to get rid of her as quickly as possible. Such a cute story about keeping true to yourself and allowing yourself to feel after loss, Evie Brooks Marooned in Manhattan is a must read for any middle grader who wants a laugh and maybe a bit of a cry! The story in this book is really well done, Evie’s mum was American and moved to Ireland for Evie’s father before she was born. Then her father ran off because he couldn’t handle parenthood. She never knew him and barely knows Scott, the uncle who is now claiming to be her proper guardian. Evie’s mum told her she was to go and live with him and its just due to her promise to her mum that she agrees to spend the summer there. But she falls in love with Scott, his vet practise and makes friends and struggles with the question of if she stays in America, what will happen to her Irish side? I loved the focus of identity, finding out who you truly are and sticking up for yourself in this book, especially when it came to the scheming horrible Leela. The writing is a little young and I think a younger middle grade child will enjoy it and have no problems reading it at all. I think I was expecting something a little older and sometimes Evie really did come across as a lot younger than she was but once I got over that I really started enjoying it. The author has successfully managed to blend serious issues in with humour and the relationships in the book were really well done. I loved that Kylie and Evie got on so well and that Greg was able to join in without the fact he was a boy being an issue. Evie’s crush on Finn was quite amusing to me as an adult because it seems so long ago for me that stuff like that was an issue but I bet a lot of younger readers will love that aspect of the story. I would recommend Evie Brooks and although the writing didn’t stimulate me as much as I hoped I loved the story and the characters so I will definitely be reading the next instalment, especially as this one ended on a bit of a cliffhanger! 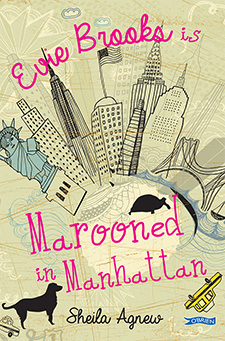 Evie Brooks is Marooned in Manhattan will be published on March 3rd by O’Brien books. My copy was sent to me from the publisher in exchange for an honest review. Sounds like a super cute book. I am adding it to my TBR list. great review.